Posted on January 10, 2016	by Gill Phillips - Whose Shoes? We are really chuffed to be invited to take part in the opening session of the NHS transformathon – a 24 hour global engage-a-thon on 27/28 January led by Helen Bevan and Alison Cameron. You can read about it here and we would love you to take part, not only in our session but any of the 24 one hour sessions that you are able to dip into. Time zone permitting and all that. @WhoseShoes @CarolLRead @FWmaternitykhft Perhaps @allyc375 & I could persuade #MatExp to be a casestudy in our slot at #NHSTform? So, who has received this invitation? The #MatExp gang. Who?? Anyone interested in improving maternity services across the world. Take a look at #MatExp on Twitter, with almost 300,000,000 Twitter impressions and you will see what I mean and perhaps why we have been invited. Not sure exactly how it is going to work yet, but I think #MatExp is going to be used as a case study into what is possible if enough passionate people come together and ‘JFDI’. No hierarchy, just people. Over the last 15 months, a fantastic community has evolved and social media has played a huge part, connecting like-minded people and helping them (us!) prove the old adage that “we are stronger together”. I have basically noticed two distinct groups of people – those who were already very active, for whom #MatExp has provided an extra platform, and those who perhaps didn’t have a channel or didn’t feel capable or ‘worthy’ but who have discovered the fantastic contribution they can make. It has been amazing to watch individuals grow in confidence and become leading change agents and in some cases highly acclaimed speakers. Storytelling is a big part of #Matexp and a lot has been written, including by my chief ‘partner in crime’ Florence Wilcock, a.k.a #FabObs Flo who vowed only to write this one blog – and has now written many! That is what happens when people get caught up in something that grabs their imagination, aligns with their values and they feel they can really make a difference! I asked Flo to describe on one piece of paper the journey so far. This was her brilliant impromptu response. Inevitably Flo’s ‘Flo chart’ does not include everything; it does not intend to – and that is the whole point. If things are missing that are important to you then you too can reflect, blog, post your own diagram or whatever you are yearning to share. No doubt it will have a different perspective, reach a slightly different audience and it will be equally valid and celebrate the diversity that makes up a change platform – even one we are building by accident. That way we evolve and grow. Flo is a wonderful, person-centred obstetrician who, as part of the NHS London Strategic Clinical Network, was looking for an imaginative way to improve maternity care across London. She had only recently joined Twitter but had spotted the work that I was doing with my Whose Shoes approach, particularly around supporting people to live well with dementia, and thought it would help in her service too. So what do these two areas have in common? The fact that we are all vulnerable human beings who want to be treated with dignity, respect and enabled to have self determination. I took up my own challenge to try and map the story of Whose Shoes? on a single piece of paper. So perhaps we are starting to see a web of change platforms, an exciting blend of people who all want positive change, but who inevitably each have a slightly different focus. Take a look for example at the work that we did linking with NHS Change Day, in which we came up with eight different actions with different people leading them. Compared with a traditional organisation, where people might be allocated different roles, this was completely different. This was not NHS-led or led by any kind of formal organisation; just people putting themselves forward because of their individual area of passion and expertise and leading on key actions. You can dive into any of these and find out more. Increasingly, visual storytelling has been important. After all, why would you go to the trouble of writing a blog like this which might attract 1000 views when some of our Steller stories have attracted 30,000 views in a couple of days? It is all about having a bit of fun, testing things out and trying to keep them fresh. Our recent #MatExpAdvent series is a good example of this as is the round up of 2015 that I attempted, also through Steller stories. So, the project officially started with a partnership between the London Strategic Clinical network and NHS England to coproduce exciting new Whose Shoes material, exploring some of the key issues around maternity experience. They commissioned five workshops all across London to test and refine the material, including producing a toolkit with guidelines as to how to replicate this in other parts of the country. They have also just published a book of case studies, sharing some of the best practice examples from all the hospitals. So this is what the formal Whose Shoes maternity experience project was intended to do. But it ignores the extra magic that you can add through social media and drawing in people who are intrigued by what is happening and want to take part. Then in turn they want to join a live event and take local ownership of their improvements. There is real excitement about the first workshop of 2016, happening at Princess Royal Hospital next week! When this happens, it becomes a ‘change platform’ rather than a ‘change programme’, even though we didn’t know this at the outset! The momentum has never flagged. 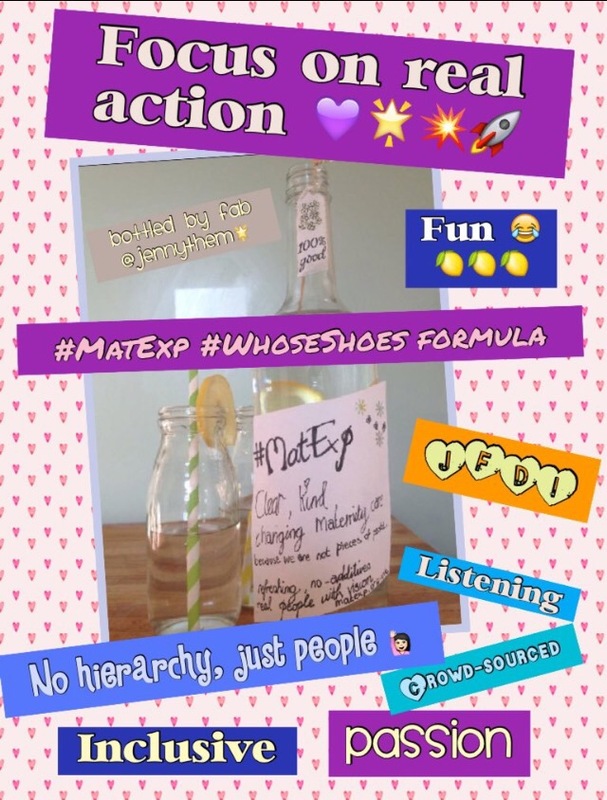 After NHS Change Day came the #MatExp ABC of key issues, Flaming June – a month of pledges and actions, #MatExponTour in an old VW van and all sorts of other popular and slightly wacky initiatives that have kept things on the boil! The NHS and formal organisations talk about wanting to engage with people. To a large extent, #MatExp has turned this on its head with women leading changes and challenging health professionals to respond. Setting up and managing the #MatExp Facebook group. Setting up and managing the matexp.org.uk website. Volunteers have also been stepping forward to set up and run the weekly #MatExphour chat, re-jigging and keeping the show on the road when people are not available at the last minute: just making it happen. Running campaigns. Speaking at events.Supporting each other. Inspiring each other. Leading real change and becoming impatient with traditional events and conferences which sometimes include a lot of … seasoned conference goers. So much has happened that this can only be a whirlwind overview. But I am going to pick out a few personal highlights, and in each case a snippet of the story that led to the event. Because these things don’t just happen; in some cases you have to make them happen. Baroness Cumberlege, Chair of the National Maternity Review, joins some Whose Shoes? discussions in Birmingham. Linking in with the National Maternity Review has got to be the Number 1. A group of us were invited to the launch event in London. People had said that they were interested in seeing Whose Shoes and talking to us about what we have been doing. There was no formal opportunity so Flo took a fantastic ‘JFDI’ approach and just put the board game out and started talking to people during the coffee break. It led to a copy of the board game being used to promote discussion at all of the review team’s community ‘listening events’ across the country and also helped promote real engagement with all the fantastic input and deep experience of our community. The first two workshops beyond the initial pilot scheme were both brilliant … and it was quite funny seeing them both claiming to be the first! Guernsey was indeed the first; and Saint Thomas’s in London was the first in the UK! Both led to amazing outcomes. There is a six page newsletter summarising what happened at St Thomas’s, including some fantastic actions, but I am not sure if there is an online link. You can find out more about the Guernsey workshop in my Steller story. But most importantly we were bowled over to hear the progress that had been made and lovely acknowledgement that came back later in the year after Guernsey’s latest NMC report. Flo worked some more magic when she managed to turn a ‘short interview’ type opportunity into … a double page spread and cover story in the RCOG magazine. 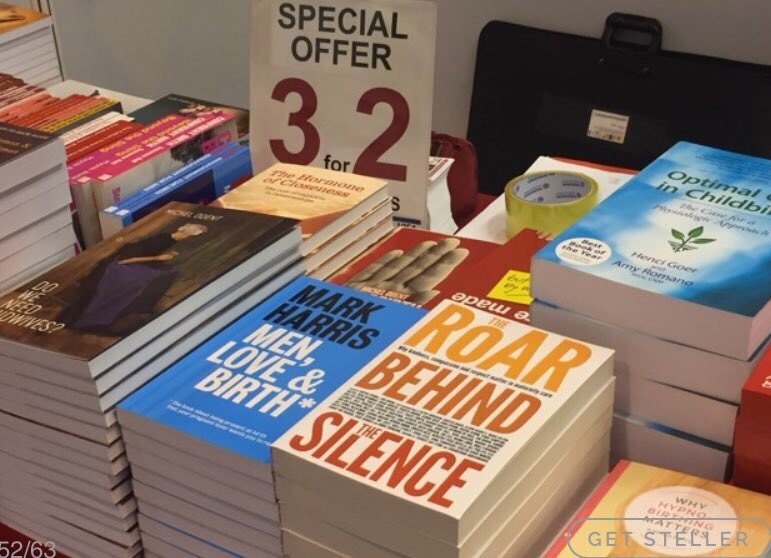 And talking about publishing successes, I nearly forgot to mention how thrilled I was to contribute to ‘ROAR behind the silence – Why kindness, compassion and respect matter in maternity care’ – the collaborative book with about 40 international contributors, compiled by Sheena Byrom and Prof. Soo Downe. It is proving very successful and has already been reprinted. What an honour! 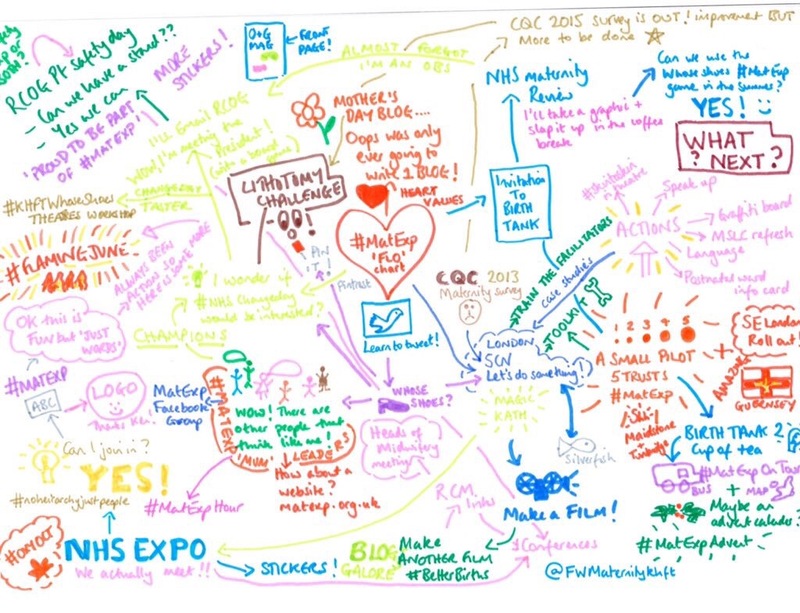 The huge NHS Expo event in Manchester was the first time that most of the #MatExp community had met in real life. We made the most of our invitation to run a workshop, with a fully interactive session including some impromptu singing when the technology didn’t work – and lots of stickers. In another room simultaneously, Helen Bevan was asking people whether their change platform was a cathedral or a bazaar, while we were busy juggling fruit! #MatExp has no budget and no real resources, but this can inspire an awful lot of creativity and innovative thinking. Unconventional methods R Us! Strong collaboration continued at the RCM (Royal College of Midwives) conference. We were not part of the formal event but invited by NHS England to share their exhibition stand. It was a really amazing day and a great example of reciprocity. Demonstrating Whose Shoes #MatExp drew a lot of extra people across to the stand as it is colourful and engaging and many had heard about it, particularly through social media. For me personally, it was a great honour indeed to be named as the ‘No. 1 radical’ of the School for Health Care Radicals. Perhaps my somewhat radical application helped, I don’t know. Anyway, I love the #SHCR and can’t wait for the next class to begin on 4th Feb. I wish I’d had it when I was myself a square peg in a round hole in my previous employment. I rocked the boat and fell out – so I am delighted now to lead an organisation that works ‘on the edge’, supporting and gaining mutual strength from the School for Health Care radicals, making friends and exchanging ideas. Boat rockers. The mavericks who are not prepared to accept the status quo when things could be so much better. So these are some of my highlights. If yours are different, tell us about them in a way that… floats your boat. So. Looking ahead into 2016. Are we feeling positive? We wanted to know what everyone thinks and so Flo conducted a little ‘JFDI’ poll. Yep. Things are looking good. Join us! Join the transformathon and follow up by getting involved and making a difference! This entry was posted in Blogs, co-production, community engagement, health, in my shoes, maternity, personalisation, well-being and tagged "NHS Change Day", #MatExp, choice and control, Compassion, empathy, healthcare, make a difference, national maternity review, Quality of life, transformation, Twitter. Bookmark the permalink. Gill your blogs and Steller stories are the foundation of #MatExp – thank you for positivity , drive and kindness .